When the Beast from the East met Storm Emma it was no fairytale. With huge swathes of the UK under red weather warnings (risk to life) and the Met Office urging us to keep ourselves safe from the onslaught of icy Siberian winds and heavy snow, the weather us Brits so like to talk about was suddenly worth talking about. With my garden cocooned under a thick blanket of white stuff, my daily 15 minutes of green was a no go. Or was it? Actually, I still found plenty of things I could do in the garden for 15 minutes, even in the snow. The good news is that temperatures are rising again and Spring is finally on its way. 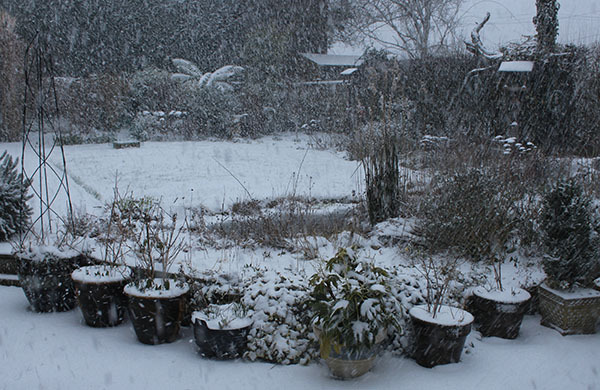 If you’ve got any tips for gardening when it snows, let me know. They might come in useful next year if the Pest from the West arrives.